I complained about split ends in my last post so I decided to do a bit of research about what causes them and how I could minimise or possibly eliminate them. Split ends are the splitting / fraying of the hair shaft. They cannot be repaired though there are products that can seal them split temporarily. Split ends are also called trichoptilosis. The causes of split ends can be divided into thermal, chemical or mechanical. This is through the use of excessive heat through heat tools like flat irons and curling irons. 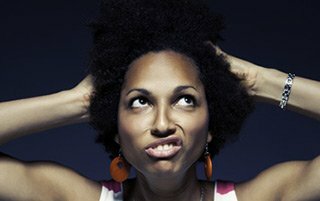 The use of chemicals like relaxers and hair colour can make hair prone to split ends. Excessive combing and general rough handling. This also covers hair tools and accessories that can contribute to the problem by snagging or tearing the hair. Keep the use of heat to an absolute minimum. Regular use heat tools can cause damage. When you do use heat tools make sure to use a heat protectant to protect the hair. Whenever you can let the hair air dry. If you want the curls loosened, air dry the hair in twists or a braid. Threading can also be used to stretch the hair. Cut down on constant combing and brushing. You can also dry your hair with an old tshirt rather than a towel which can be harsh / rough on the hair. Also guard against friction of the hair on fabrics eg collars, coats etc. Avoid hair accessories that snag and break the hair e.g. accessories with metal on them. Also avoid using rubber bands on the hair. These can be very damaging especially when used to tie puffs / buns. It is important to keep the hair moisturised. This can be done by deep conditioning the hair regularly and by applying a water based moisturiser daily. When you can, protect the ends of the hair by just doing styles that ensure they are tucked in eg a hair bun. The ends of the hair are the oldest part of the hair shaft and also where splits are most likely to appear. To trim buy a scissors made to cut hair. Use it only for the hair and nothing else. This will ensure it remains sharp and is not blunted by cutting paper etc. As with all chemical processes, relaxers and hair colour can lead to damage, especially if applied incorrectly. Make sure the relaxer does not over process the hair. Also ensure that if your hair has colour you give it some extra attention to counter the possible drying effects of the hair colour. Protein treatments strengthen the hair. These can be done occasionally to keep the hair strong. I use ORS Hair Mayonnaise about once a month for this. There are many other treatments on the market now especially with the advent of online shopping. Do you have a way to prevent split end that you can share?